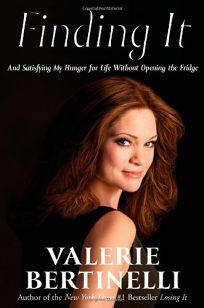 In her latest memoir, TV personality (and Jenny Craig spokesperson) Bertinelli explores questions of change and identity after having lost 40 pounds, a personal project she described quite publicly in 2008&apos;s Losing It. Newly svelte, Bertinelli&apos;s next challenge is facing the fact that weight loss is not exactly a cure-all: ""I discovered that the life I want isn&apos;t about reaching a single goal."" Bertinelli&apos;s obsession with food and weight maintenance is all-consuming, and, once pleased with her body, she finds herself unable to conceive of what&apos;s next. What she reveals about life at 48, aside from weight loss issues, is enjoyable and oftentimes hilarious: struggling with the adulthood and sexuality of her son Wolfie, searching for God, and waxing regretful over her lack of formal education. She shouldn&apos;t: her talent for humor, candor and fostering intimacy with readers is apparent on every page. Looking at middle-aged life with a boyfriend and a mixed family, Bertinelli is ceaselessly honest and pretense-free, and should get readers cheering for her accomplishments-even if they&apos;re no more than looking fantastic in a bikini at 48.